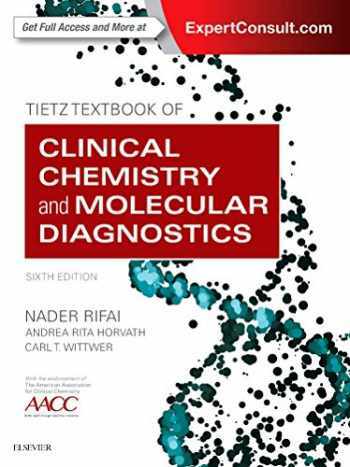 Acknowledged author Nader Rifai wrote Tietz Textbook of Clinical Chemistry and Molecular Diagnostics, 6e comprising 1888 pages back in 2017. Textbook and etextbook are published under ISBN 0323359213 and 9780323359214. Since then Tietz Textbook of Clinical Chemistry and Molecular Diagnostics, 6e textbook received total rating of 4 stars and was available to sell back to BooksRun online for the top buyback price of $90.37 or rent at the marketplace. The Tietz Textbook of Clinical Chemistry and Molecular Diagnostics, 6th Edition provides the most current and authoritative guidance on selecting, performing, and evaluating the results of new and established laboratory tests. This classic clinical chemistry reference offers encyclopedic coverage detailing everything you need to know, including: analytical criteria for the medical usefulness of laboratory tests, variables that affect tests and results, laboratory medicine, applications of statistical methods, and most importantly clinical utility and interpretation of laboratory tests. It is THE definitive reference in clinical chemistry and molecular diagnostics, now fully searchable and with quarterly content updates, podcasts, clinical cases, animations, and extended content online through Expert Consult.Analytical criteria focus on the medical usefulness of laboratory procedures. Reference ranges show new approaches for establishing these ranges ― and provide the latest information on this topic.Lab management and costs gives students and chemists the practical information they need to assess costs, allowing them to do their job more efficiently and effectively.Statistical methods coverage provides you with information critical to the practice of clinical chemistry. Internationally recognized chapter authors are considered among the best in their field.Two-color design highlights important features, illustrations, and content to help you find information easier and faster.NEW! Internationally recognized chapter authors are considered among the best in their field.NEW! Expert Consult features fully searchable text, quarterly content updates, clinical case studies, animations, podcasts, atlases, biochemical calculations, multiple-choice questions, links to Medline, an image collection, and audio interviews. You will now enjoy an online version making utility of this book even greater.UPDATED! Expanded Molecular Diagnostics section with 12 chapters that focus on emerging issues and techniques in the rapidly evolving and important field of molecular diagnostics and genetics ensures this text is on the cutting edge and of the most value.NEW! Comprehensive list of Reference Intervals for children and adults with graphic displays developed using contemporary instrumentation.NEW! Standard and international units of measure make this text appropriate for any user ― anywhere in the world.NEW! 22 new chapters that focus on applications of mass spectrometry, hematology, transfusion medicine, microbiology, biobanking, biomarker utility in the pharmaceutical industry and more!NEW! Expert senior editors, Nader Rifai, Carl Wittwer and Rita Horvath, bring fresh perspectives and help ensure the most current information is presented.UPDATED! Thoroughly revised and peer-reviewed chapters provide you with the most current information possible.